The Princess V48 shows that some builders still think about change carefully. And it seems to help them get it right the first time. 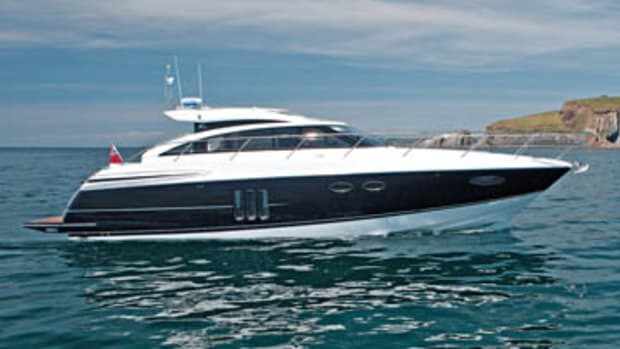 The folks at Princess Yachts are a pretty conservative lot. Look at their boats over the past decade and you’ll see a consistency in both design and engineering that’s rare in the boat business. You won’t find this British builder making digressions into wild colors, radically shaped windows, or outrageous appendages, and the styling philosophy is such that this year’s boat isn’t rendered obsolete by that of next year. A tradition of obstinate conservatism makes the new V48 stand apart on two counts. One, its hull and deck are laminated using resin infusion. Now you’re probably saying, “So what? Other builders have been doing that for years.” True, and the reason that Princess is towards the back of this queue is that it insisted on fine-tuning its version of the process before phasing it in as models came up for redesign. 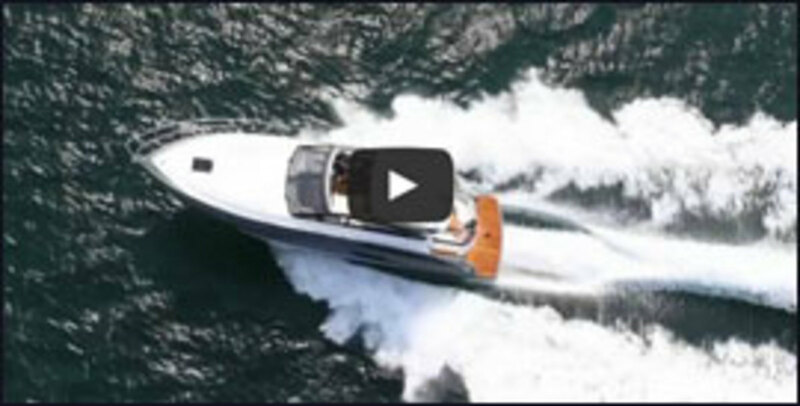 The first boat to get the full treatment was the V78, which was introduced four years ago. 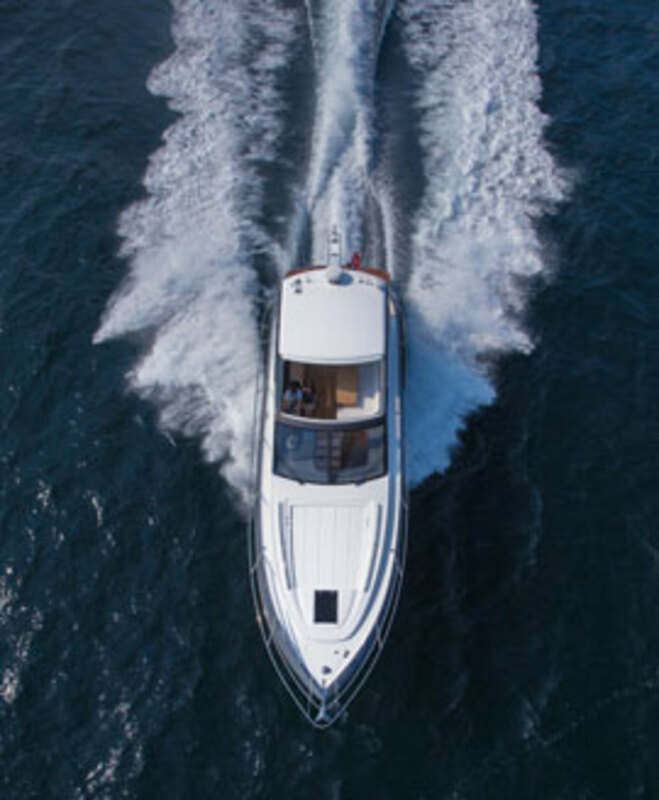 Each year since, every new Princess has been resin-infused, so naturally when it was decided to finally end the run of the iconic V45 (which never came to the United States), its replacement, the V48, was designed and engineered from the keel up to be built using that process. Most builders will tell you that resin infusion is great because it saves a lot of weight, and some even offer specific figures. Princess is cagier—or rather more conservative. I couldn’t get any of the engineers buzzing around the dock on test day to venture a guess at how much lighter this boat is than she would have been had she been laid up conventionally. In fact, they didn’t seem to really care. All they wanted to talk about was how the process makes for a much cleaner factory and a much more solid boat. I can’t attest to the factory as my schedule didn’t allow for a tour, but I can tell you that this boat is as solid as a brick. Out in the 3- and 4-footers that roiled the waters beyond the old World War II torpedo barrier in Plymouth Harbor—Princess’s homeport—we repeatedly ran her up to full throttle (31.1 knots), and despite the jarring conditions, I heard not a creak or groan. The sensation of a solid and secure ride was no doubt enhanced by the notably low sound levels—just 71 decibels at 3000 rpm (21.1 knots). Princess has a reputation for solid acoustical engineering, and its newest models set a new standard. Part of the reason why is no doubt the solidity that comes with resin infusion, but another part is because this builder traditionally invests heavily in sound attenuation materials and techniques—even when they aren’t visually apparent. 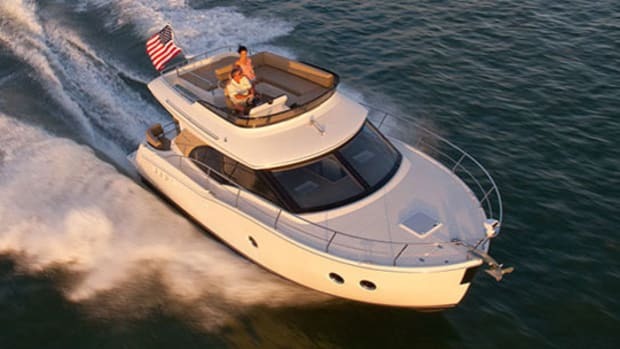 One example: Both saddle fuel tanks are wrapped in foil-lined acoustical insulation to preclude resonance, which, if left unattended, will migrate to the rest of the boat. But the real news on this boat is IPS. From the numerous factory people I interviewed, both on and off the record, it seems clear that the decision-makers at Princess were wary about building a pod-drive boat. 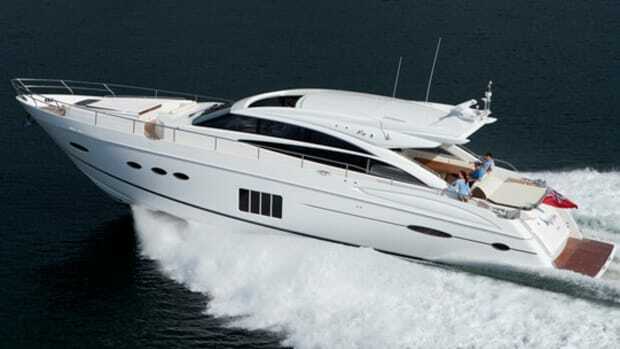 That’s partly because Princess being Princess, they’d have to go about it their way, which means first building some prototypes, then engineering the V48 specifically for IPS—no sharing the hull with a stern drive or inboard. That’s risky since it’s possible that IPS won’t fly with Princess customers who are—you guessed it—conservative. So it’s really an open question as to how Princess’s traditional audience will take to this model—especially since it is the only IPS boat in the line. 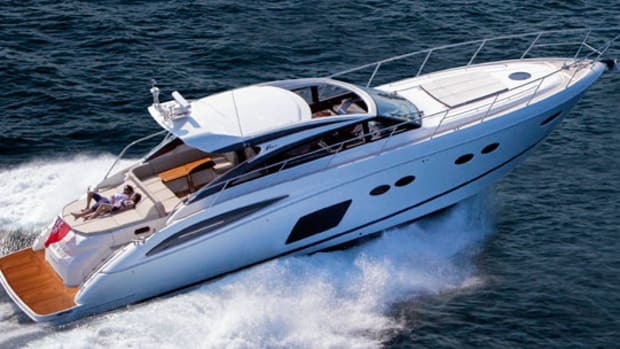 I was told that Viking Sport Cruisers, the Princess distributor for the Americas, lobbied for an IPS boat, and I’m guessing they’re delighted by how it turned out. 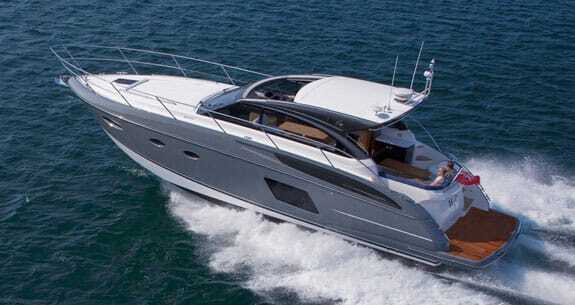 The extra room that comes courtesy of the engines being nearly up against the transom is bound to be popular with Americans who are all about space. 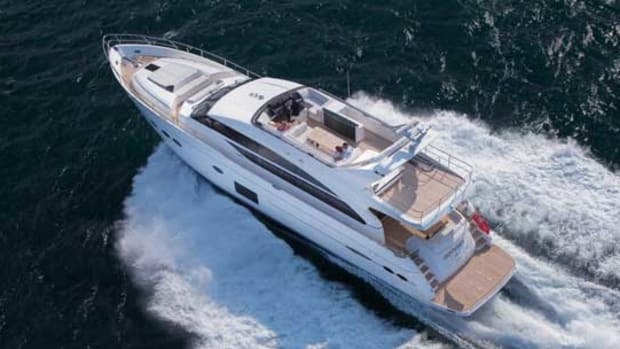 And those who like to bring guests aboard, be they adults, children, or grandchildren, will love the nifty “scissors” V-berth: It can slide together to form one big bed for a couple or apart to create two single berths for the younger set. An en suite head with enclosed shower is the icing on the cake. But the real impetus behind IPS in this boat is the full-beam amidships master stateroom. Don’t let the placement of this cabin fool you. This is not one of those cuddys that require you to double over so you can climb into bed, or in which you bang your forehead if you sit up in bed too quickly. There is a lot of space here, plenty for most people to be able to move around freely without stooping, and thanks to large side windows, everything is bathed in light when you raise the standard blinds. And like the stateroom up forward, this one has en suite facilities complete with an enclosed shower. Princess designers may be conservative but they’re also shrewd. They made the cockpit U-shaped, with only one starboard walkway to the side decks and standard hydraulic swim platform instead of having port and starboard walkways. Yes, traffic flow is a bit more restricted this way, but in compensation you get seating for at least four more people. The cockpit is a very sociable area that works for dining, thanks to a hydraulic hi-lo table, and sunning, because it’s not covered, although an extendable sunshade is standard. 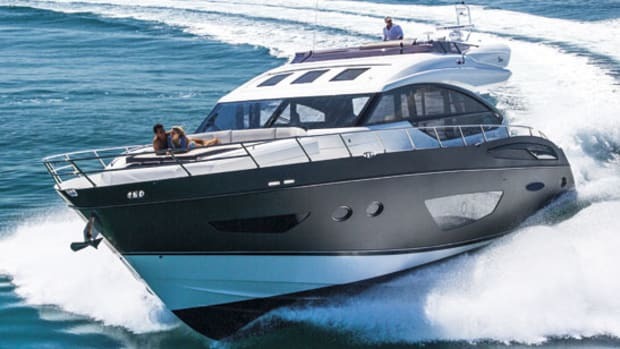 For a builder hardly known for winging it, the IPS-powered V48 is an uncharacteristic gamble. But this is a company that always hedges it bets, and I’m wagering when its conservative customers see that big master stateroom, they’ll take a very liberal approach to this boat. 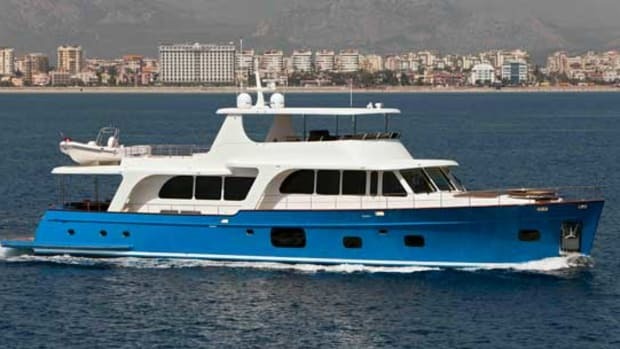 air conditioning; cockpit wet bar w/ electric grill; 13.5-kW genset; dockside TV and phone outlets; holding tank system w/ dockside and overboard discharge; Hubbel 50-amp shore power cord; linens and pillows; second entrance to forward head; Simrad RS 87 VHF; 29” LED TV in master; Garmin autopilot, radar, and multigauge; cutlery, glassware, and china for six. 264 gal. fuel, 80 gal. water, 9 people, 500 lb. gear. 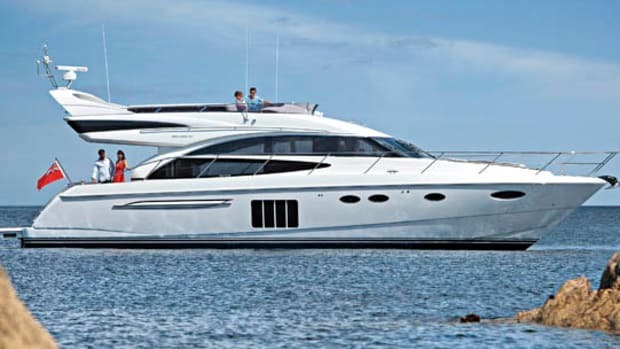 This article originally appeared in the August 2014 issue of Power & Motoryacht magazine.